In pursuit of effective ways to serve malicious software to Windows computers, cybercrooks often bank on different types of social engineering. 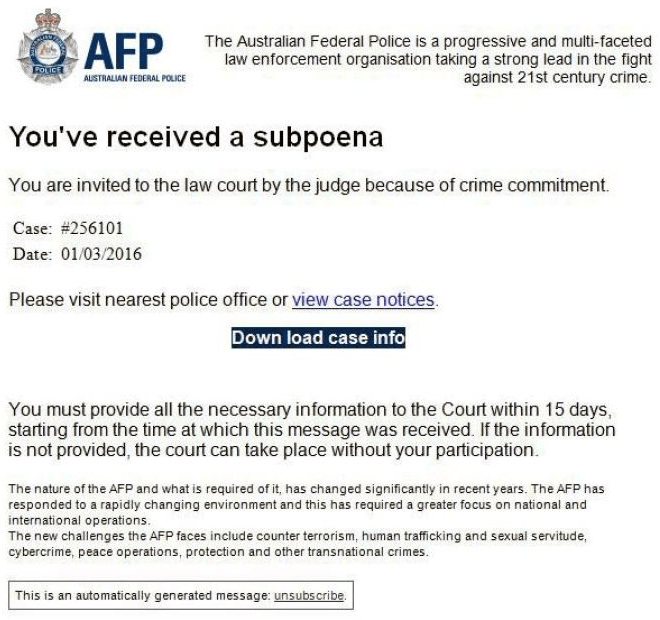 In one of the recent hoaxes, the criminals have been sending emails with rogue subpoenas allegedly on behalf of the Australian Federal Police. This scam, obviously, targets Australians and tries to infect their machines with malicious code. Offending routine involving the impersonation of law enforcement organizations typically features geo-targeting, where computer users living in a particular part of the globe receive fraudulent emails from institutions that are familiar to them. The AFP email scam, for instance, has been circulating strictly within Australia as the threat actors behind it pretend to act on behalf of the Australian Federal Police. Numerous users are receiving subpoenas over email that look legit and try to dupe people into clicking a virus-tainted hyperlink. The message says, “You’ve received a subpoena. You are invited to the law court by the judge because of crime commitment.” It also contains the case number, date, and a recommendation to visit the nearest police office or view case notices. Of course the recipients committed no felony in fact. However, the true-to-life look and feel of these emails entices the targeted users to learn more. As it has been mentioned, the main catch is all about the link embedded in the email body. It’s strongly recommended to abstain from following it, and here is why. The link redirects users to a Russian website that hosts a booby-trapped file and tells the would-be victims to download it. As per scrupulous analysis of this hoax, the landing spots mostly include subpages within the xpom74.ru domain. While believing they are about to download their case info, people may end up catching a piece of malicious software. For instance, this tactic is known to spread crypto ransomware, a digital plague that encrypts all personal data on local, removable and mapped drives, and then extorts money for decryption. If a fishy subpoena-related email from the Australian Federal Police appears in your inbox, the rule of thumb is to refrain from clicking any links in it, otherwise the PC may get compromised by aggressive malware. To make sure no bad code has infiltrated your computer, run a scan with a reputable security suite and see whether you are on the safe side. The extermination of malicious entities accompanying the Australian Federal Police email scam can be efficiently accomplished with reliable security software. Sticking to the automatic cleanup technique ensures that all components of the infection get thoroughly wiped out from your system. 2. The scan will come up with a list of detected items. Click Fix Threats to get probable malware removed from your system. No ratings yet.